This post offers supplementary material for an article I recently wrote for TVO, which you should read before diving into this post. Click on images for larger versions. 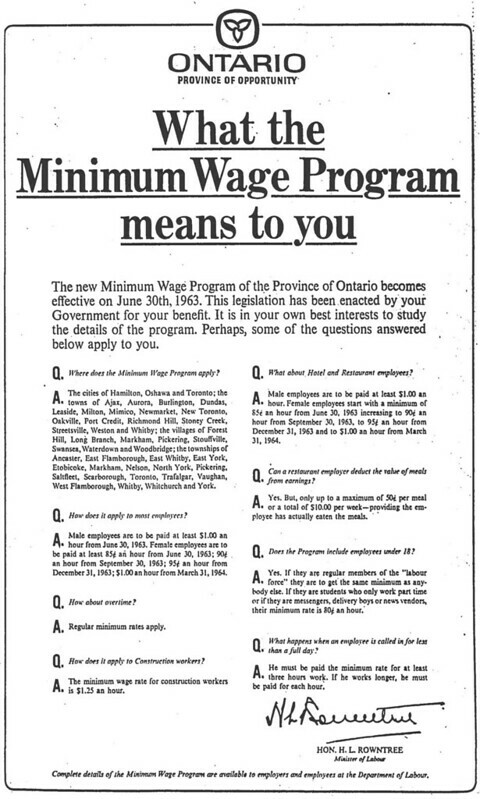 The ads produced by the province to explain the implementation of minimum wages in the Golden Horseshoe. These versions originally appeared in the June 11, 1963 edition of the Globe and Mail. 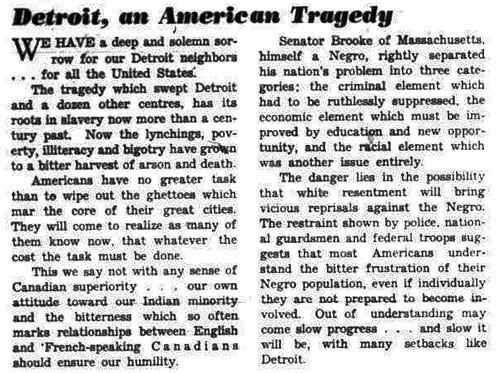 Toronto Star, September 6, 1963. 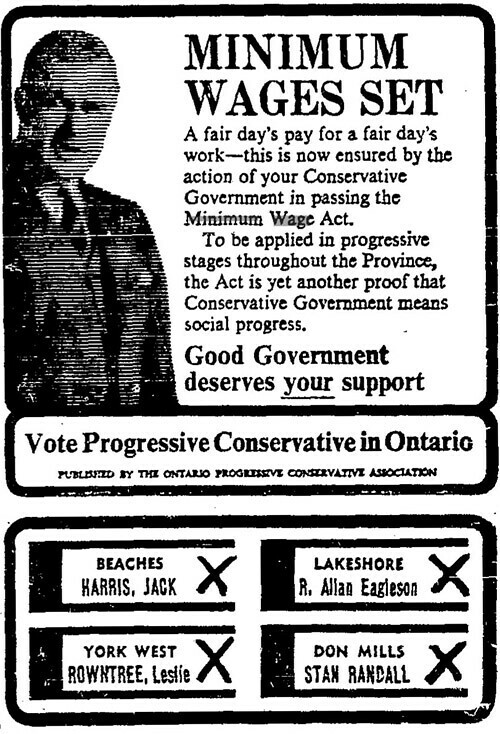 How the Progressive Conservatives presented the minimum wage during the 1963 provincial election campaign. Small ads like these were used to tackle the various points of the Tory platform, including topics like margarine colouring. 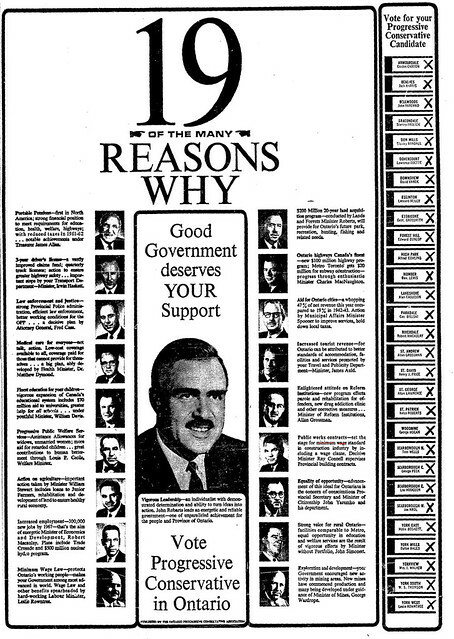 Note the local candidates spotlighted in this ad, who range from Minister of Labour Leslie Rowntree to future disgraced hockey figure Alan Eagleson. 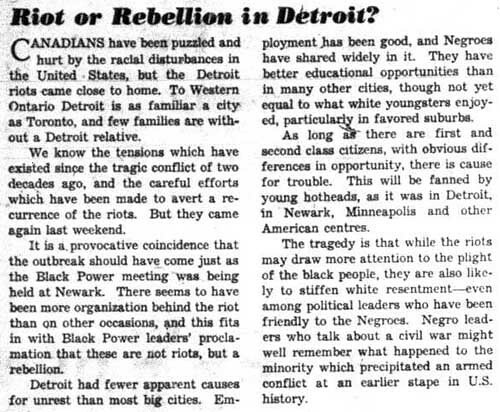 Toronto Star, September 17, 1963. 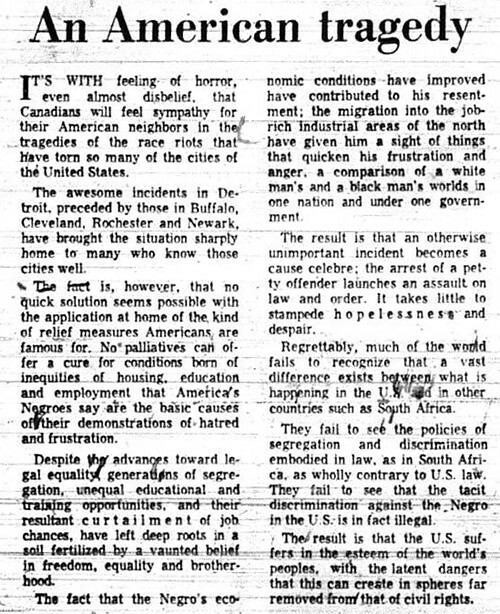 Toronto Star, September 21, 1963. 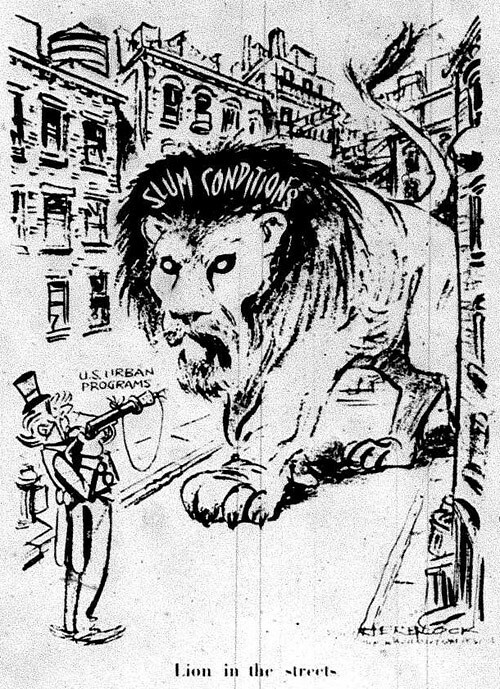 A Communist campaign ad mentioning minimum wage. There had been Communist MPPs (or Labour-Progressives as they were known) sitting at Queen's Park as recently as 1955, when Joe Salsberg was defeated after a 12-year tenure in the Toronto riding of St. Andrew. 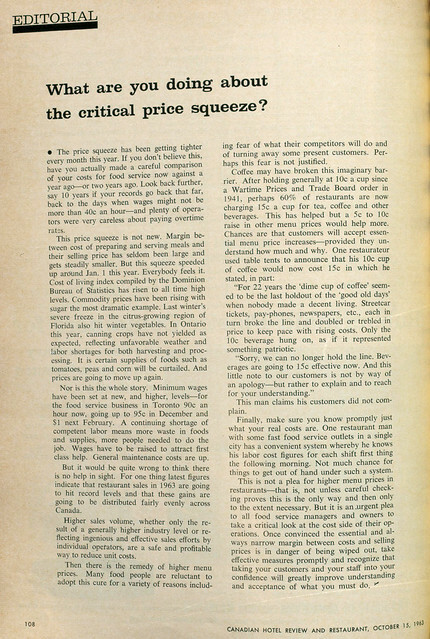 Canadian Hotel Review and Restaurant, October 15, 1963. An editorial on how the hospitality industry could handle minimum wage and other increasing cost factors. Globe and Mail, May 5, 1964. The provincial ad used to explain the rollout of minimum wage across the rest of the province, including a zone map. As far as we can tell, the schedule went as planned, and the $1 minimum wage was fully implemented by the end of 1965. Canadian Hotel Review and Restaurant, September 15, 1964. 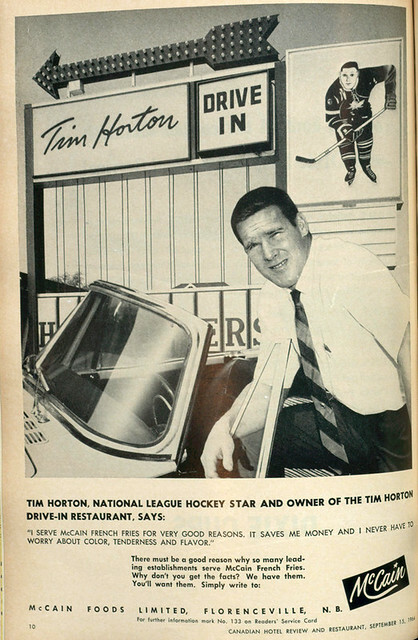 Since Tim Horton's is at the heart of the current debate surrounding minimum wage hikes, here's an ad I stumbled upon for the hockey legend's less successful drive-in chain. This was part of a series of testimonial ads for McCain's which appeared in Canadian Hotel Review and Restaurant during the mid-1960s. Globe and Mail, December 4, 1968. 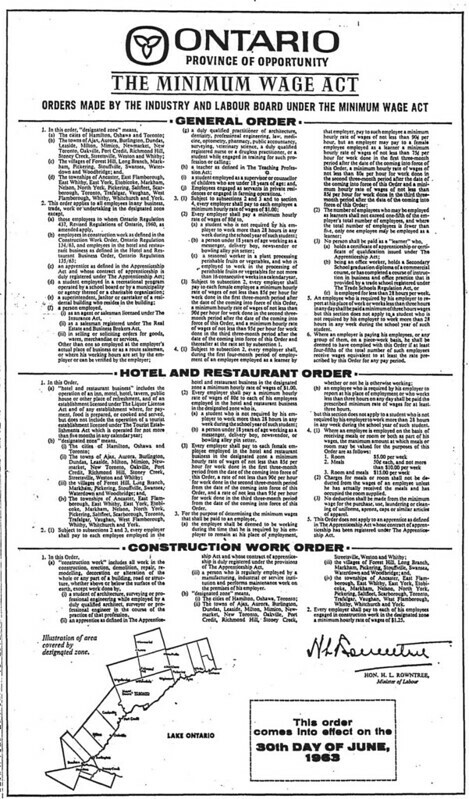 A provincial ad for the next minimum wage hike, along with other employment reforms, which was implemented in January 1969. This post offers supplementary material for an article I recently wrote for TVO, which you should read before diving into this post. 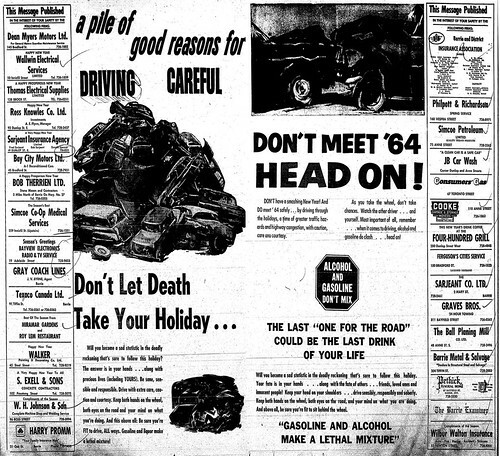 Here's a sampling of the ads that were discussed in the piece. 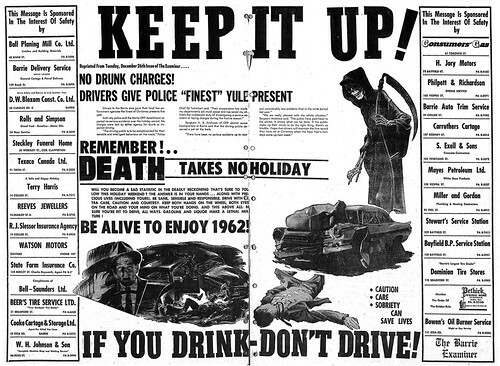 Note the rise and fall of the ghoulishness factor, especially among the Christmas-centric ads. Click on the images for larger versions. 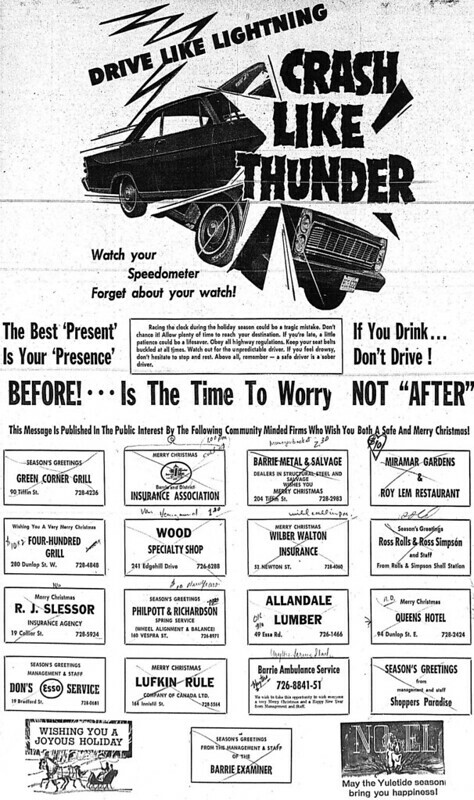 Barrie Examiner, December 31, 1959. 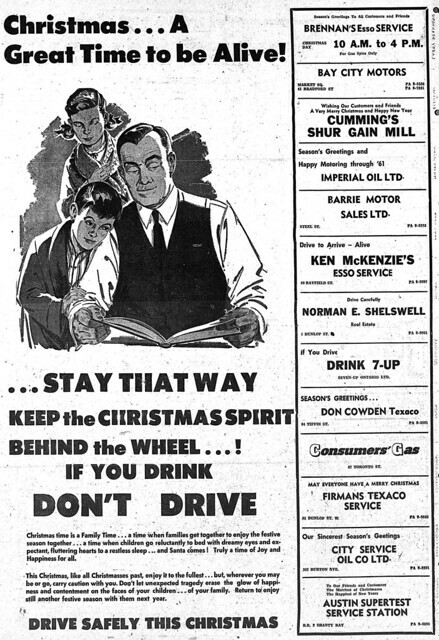 Barrie Examiner, December 24, 1960. 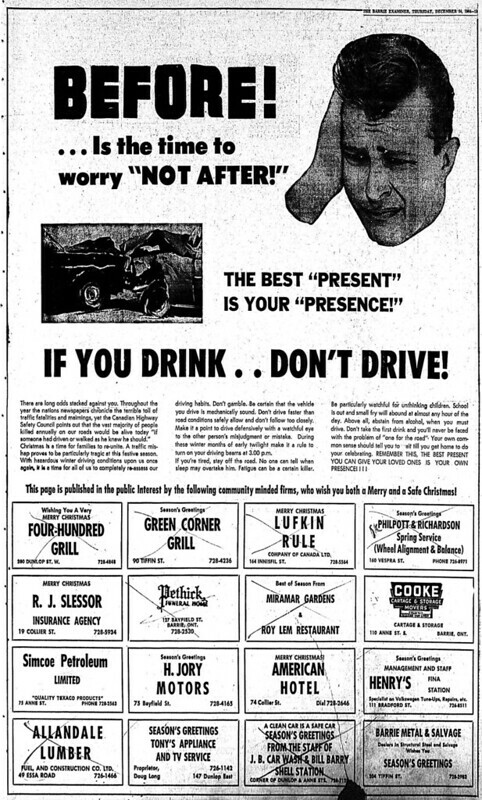 Barrie Examiner, December 30, 1960. 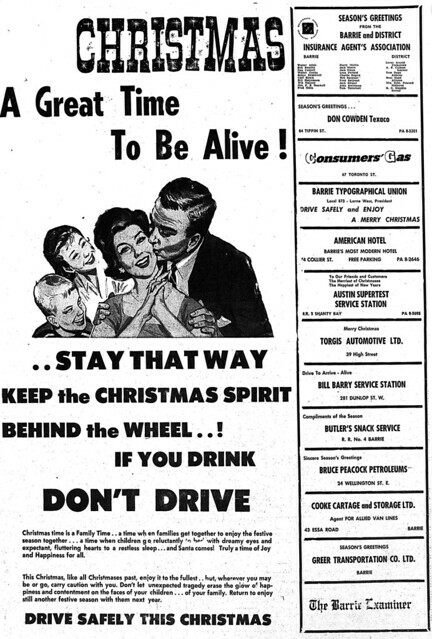 Barrie Examiner, December 23, 1961. 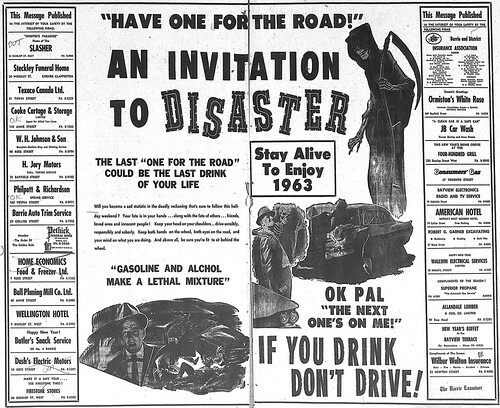 Barrie Examiner, December 30, 1961. 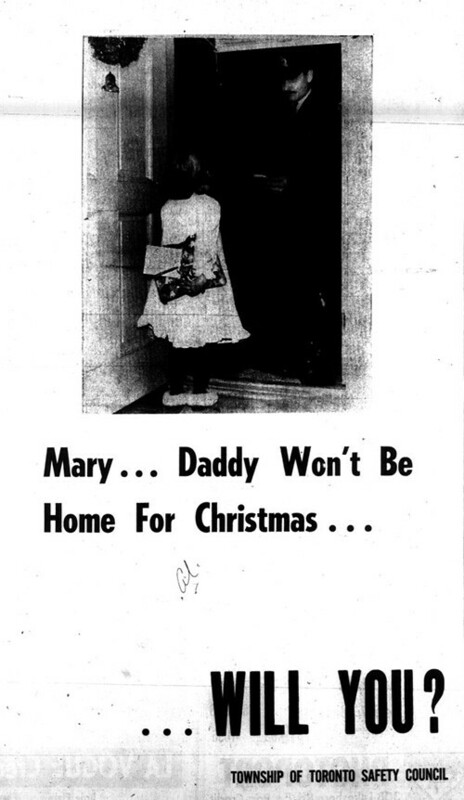 Barrie Examiner, December 31, 1962. 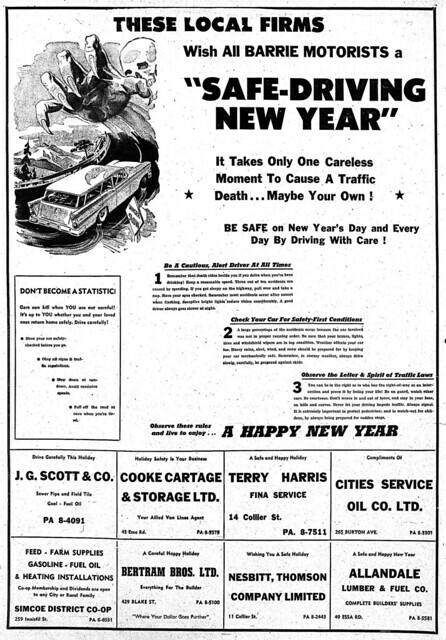 Barrie Examiner, December 30, 1963. Barrie Examiner, December 24, 1964. Barrie Examiner, December 24, 1965. Barrie Examiner, December 31, 1966. The Weekly, December 20, 1967. 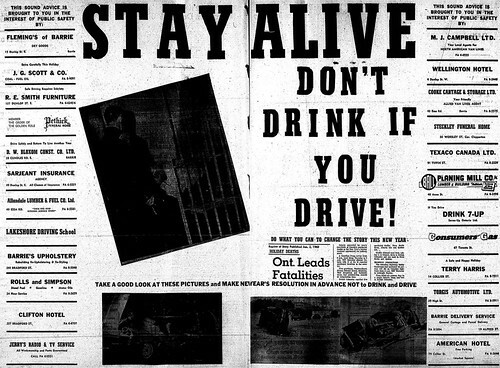 I tried to find similarly ghoulish ads in other Ontario newspapers, and discovered this safety campaign from Toronto Township (present-day Mississauga) which ran during the mid-to-late 1960s. 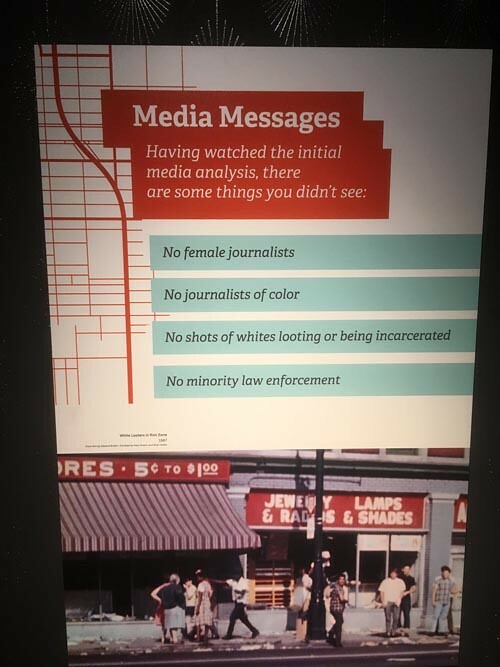 Panel from the Detroit Historical Museum's exhibit, Detroit 67: Perspectives. July 8, 2017. 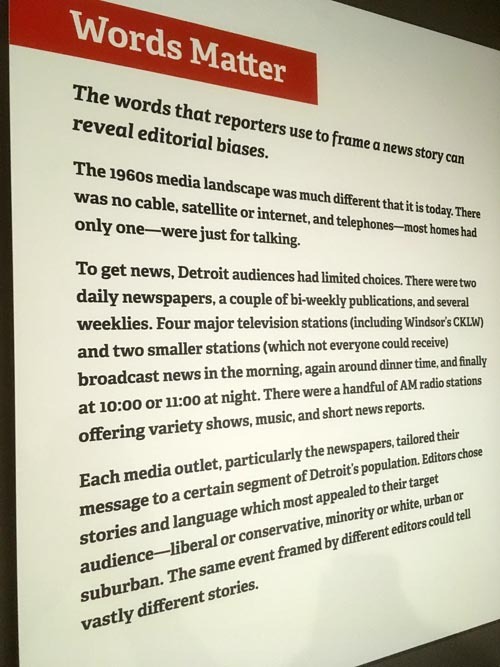 One of the elements I appreciated in the current Detroit Historical Museum exhibit on the civil unrest in Detroit in 1967 was its analysis of the media coverage. One panel lists what elements that we might expect today were missing. For television coverage, a space designed to evoke a middle class living room displayed footage on screens resembling vintage sets. As you'll see from the articles included in this post, the Canadian coverage followed a similar playbook. As the disturbance grew the morning of July 23, authorities urged the media to avoid or downplay reports, in order to maintain calm. It quickly became impossible to hide what was going on. CKLW-TV (now CBET) provided the first local TV report around 2 p.m. Soon, reporters from outside the region began descending on the region. The Windsor Star initially ordered its employees to stay out of Detroit, threatening to dismiss anyone who did. According to Herb Colling's book Turning Points, the paper's executive editor was "concerned about the safety of his staff and about insurance coverage and liability, especially if someone is injured or killed." Reporters grew demoralized as peers from London and Toronto headed across the border. The paper's bureaus in Chatham and Sarnia went ahead and sent staff across, but they had to send their reports to other papers. Front page, Windsor Star, July 25, 1967. Click on image for larger version.. The city many Windsorites regard as an extension of their own was struggling to return to normal this morning. But Detroit will somehow never be the same. Commuters, most of whom had not seen Detroit since they left their jobs Friday, were confronted with grim and often shocking sights as they slowly filtered back to work today. Khaki-clad militiamen, their rifles slung over their shoulders, looked strangely out of place patrolling back and forth in front of Hudson’s. Convoys of Michigan State Police cruisers, bristling with automatic weapons, threaded their way around barricades blocking the entrances to side streets. Over the course of the day, revised front pages updated the body count. Reports updated the situation at the border, where restrictions were gradually eased. Tunnel bus service resume and commuters were allowed to cross, but those curious to see the riot for themselves continued to be turned back. One article outlined the effects on Windsor's nightlife. Clubs which depended on American audiences, such as the Elmwood Casino, Metropole, and Top Hat, cancelled their shows. Downtown bars reported healthy business from those who came down to watch what was unfolding across the river. Windsor Star, July 25, 1967. Cartoon by syndicated political cartoonist Herblock, Windsor Star, July 25, 1967. W.L. Clark's column touches on a growing fear in Windsor: that the upcoming annual Emancipation Day celebration might provoke racial unrest. Emancipation Day, which I'll discuss in more detail in an upcoming post, is a longstanding tradition celebrating the abolition of slavery. As the following story notes, it became a touchy topic for those prone to participating in call-in radio shows. London Free Press, July 25, 1967. Papers seized upon the statements of radicals and hotheads, with varying degrees of shock value. They also played up the atmosphere being carnival-like in some spots. London Free Press, July 25, 1967. Click on image for larger version. Globe and Mail, July 25, 1967. Click on image for larger version. 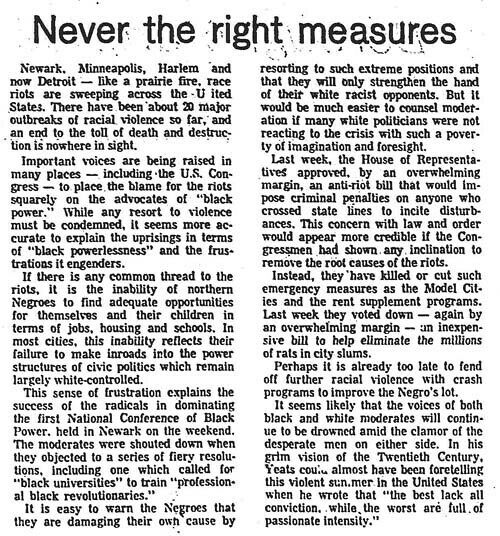 Globe and Mail, July 25, 1967. 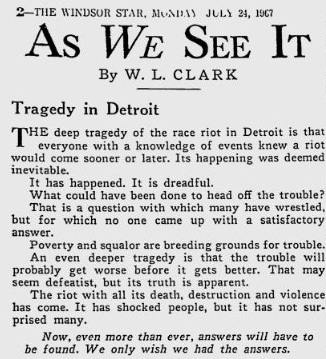 Canadian papers noted how looting was a multiracial effort, though while reading some reports I had the sinking feeling that's a familiar strain: blacks who engage in such activity are dangerous, while whites are just having a good time. The Globe and Mail went with an AP report. The paper sent two of its reporters, including future longtime Toronto Sun columnist Gary Dunford, to be their "Star man on the scene." 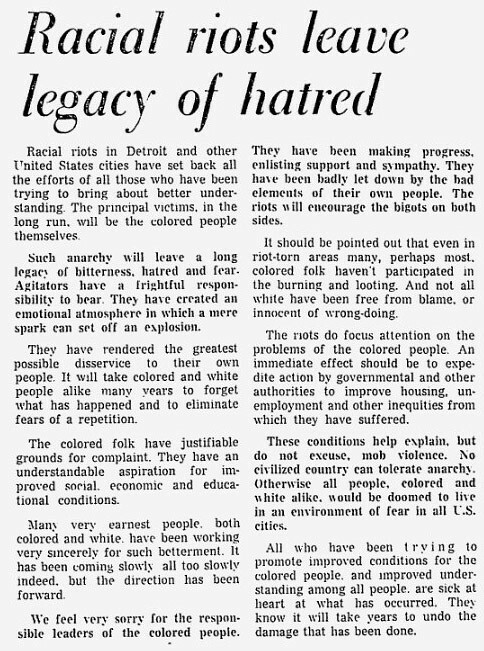 Toronto Star, July 25, 1967. 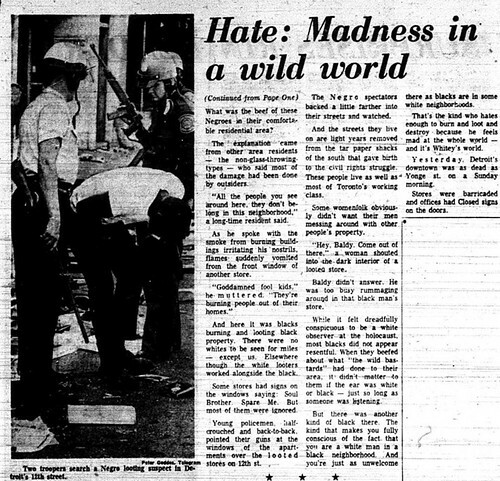 Toronto Star, July 25, 1967. Click on image for larger version. 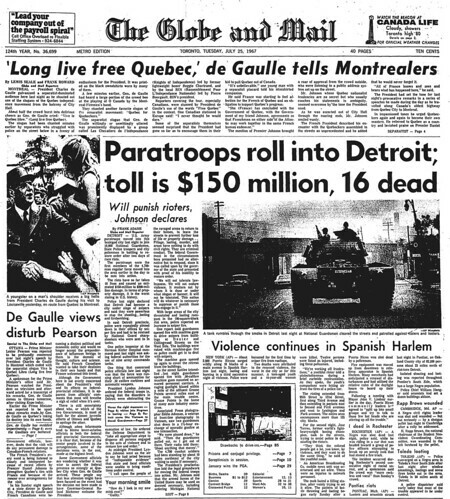 Front page, the Telegram, July 25, 1967. Click on image for larger version. The Telegram, July 25, 1967. Click on image for larger version. The Telegram, July 25, 1967. Filling in for Telegram TV critic Bob Blackburn, Kathy Brooks criticized CBC's Newsmagazine program for spending more time covering the fallout from Charles deGaulle's visit to Quebec. "Discussions about news judgement rarely get anyone anywhere," Brooks wrote, "but this time, in the long run, a rising death toll in a race riot seems more important than what kind of flag was flying on President de Gaulle's ship." Poster hanging outside the Detroit Historical Museum, July 8, 2017. 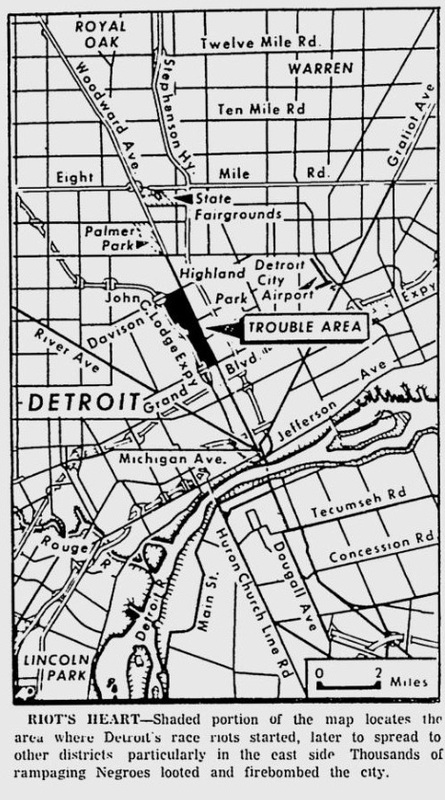 A police raid on a “blind pig” (an unlicensed drinking venue) at 12th Street and Clairmount Avenue in the early morning hours of July 23, 1967 provided the fuse for five days of civil unrest in Detroit. 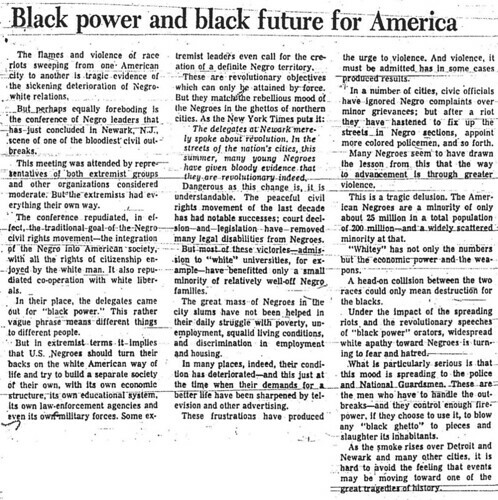 Whether you call what happened that week a rebellion, riot, or uprising, the repercussions are still evident around the city, and remain a well-debated subject. 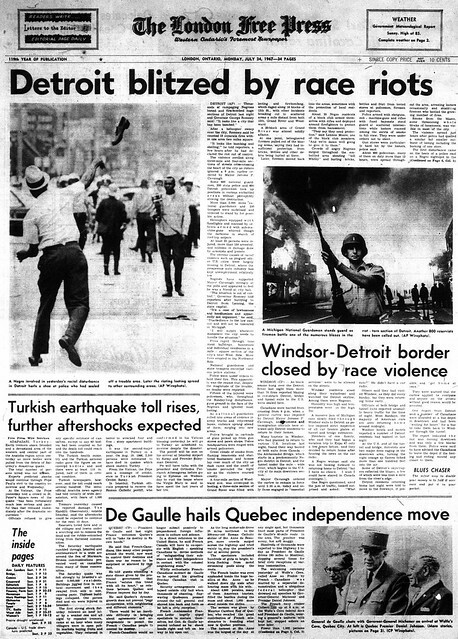 Given Detroit’s proximity to Canada, the events that unfolded affected Windsor, and were commented on elsewhere around the country. 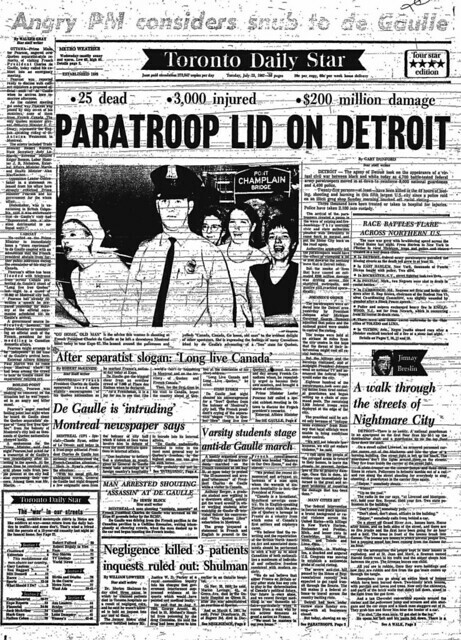 What I aim to do with these posts is show Canadian reaction to the events in Detroit, primarily from newspapers in Toronto and Windsor. Collecting newspaper stories: Side stories I saved while researching Canada’s centennial, others I tracked down out of personal interest. 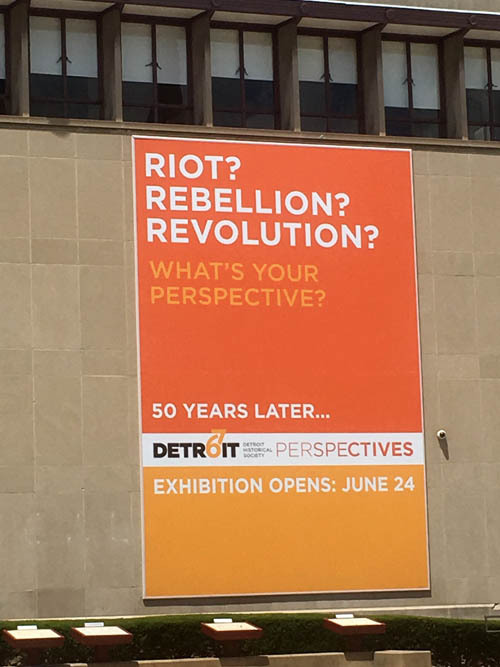 Museum visits: if you’re visiting Detroit during the next two years, I highly recommend the Detroit Historical Museum’s Detroit 67:Perspectives exhibit, and its accompanying online material. 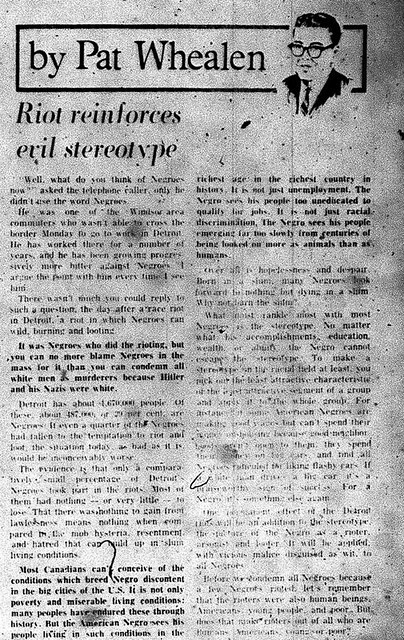 Some of this material was originally gathered for a piece I was going to write for an online publication, but was abandoned due to other commitments and finding many side stories about race in Essex County during the 1960s. These stories I want to explore further, and will write about as time permits. 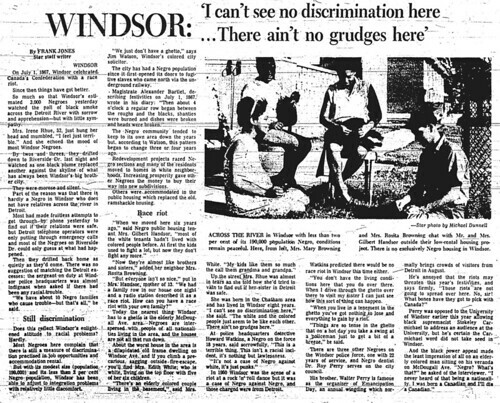 I’m still digesting some of these events around Amherstburg and Harrow, stories never discussed during my formative years which are eye-opening (but not terribly shocking). Part of an exhibit on 1967 in Windsor on display at the Chimczuk Museum. Photo taken July 9, 2017. 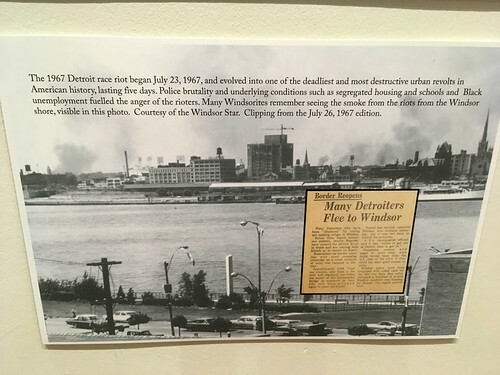 In his book Turning Points: The Detroit Riot of 1967, A Canadian Perspective, Herb Colling describes the atmosphere in Windsor as July 23 wore on. For most people in Windsor, July 23 is a normal summer Sunday with church attendance, swim meets, backyard barbecues and picnics in the park but, by afternoon, the reality of racial turmoil is literally burned into the Canadian consciousness. 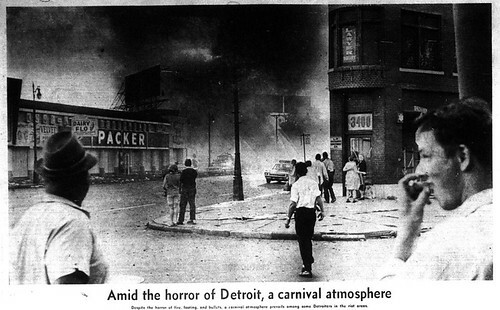 At 2:00 p.m., the first smudges of black smoke in Detroit are visible from Windsor. As darkness falls, five major fires burn several blocks apart; their flames reflect orange and pink off the clouds. 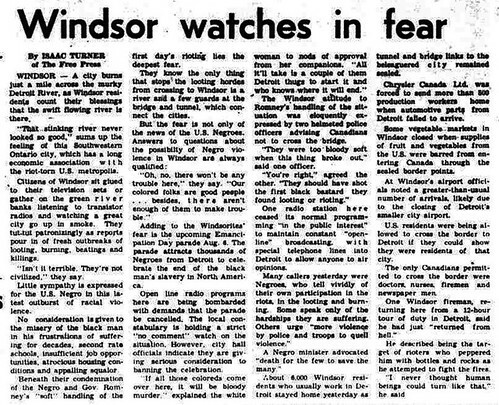 All afternoon, Windsorites congregate in waterfront parks on the border to watch the smoke and listen for sounds of the riot. Teenage boys sit on the hoods of their cars or lean against break walls as they hug their girlfriends protectively. They gossip with picnickers and fishermen, point and exclaim every time they see a new disturbance. In Canada, the riot is a uniting force, a powerful draw for a shocked people with a morbid fascination—a horror on one hand and yet an excitement that something significant is happening in their own backyard. Curiosity over what was going on created traffic jams along Riverside Drive. “Most of the time [the fires] appeared as dull, rosy glows against the skyline,” the Windsor Star reported, “but every now and then a tongue of flame shot into the air in a spectacular burst visible for miles” A band concert scheduled for Dieppe Gardens that evening went ahead, with the smoke providing a backdrop. Reading the descriptions feels like there was an element of spectator sport going on among those who gathered on the waterfront, with the mix of awe and horror that accompanies watching crashes. There was a limit to how much Windsorites could fulfill their curiosity. By 9 p.m. the border was closed except for emergency personnel and those who could prove they had legitimate business or pre-scheduled vacations allowed to cross into the United States. Tunnel bus service was suspended. Chrysler workers were sent home when parts were held up in Detroit. People were stuck on either side of the border, resulting in nights spent with friends and relatives, jammed phone lines, and hotels on the outskirts of Windsor filled to capacity. Some Detroiters jumped in their boats and sailed over to Canada. 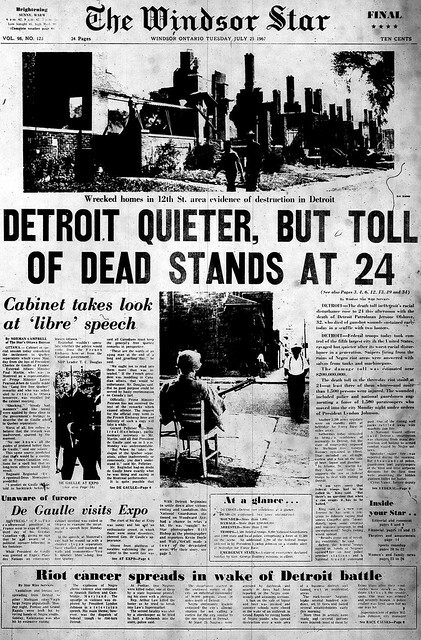 Front page, Windsor Star, July 24, 1967. Click on image for larger version. 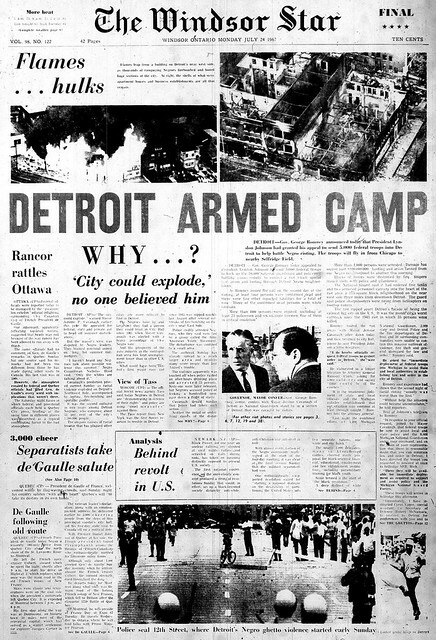 Front page of final edition, Windsor Star, July 24, 1967. Click on image for larger version. 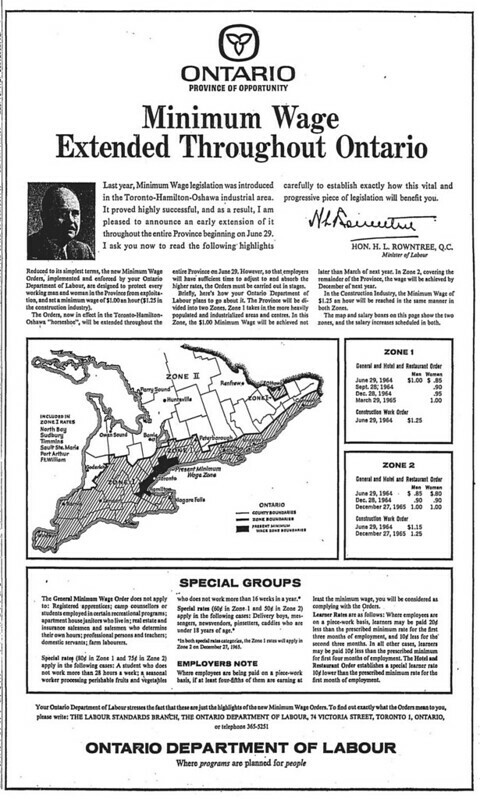 While there was radio and television coverage, newspaper readers in Windsor and elsewhere in Canada had to wait until the morning editions rolled off the presses on July 24 for print analysis. 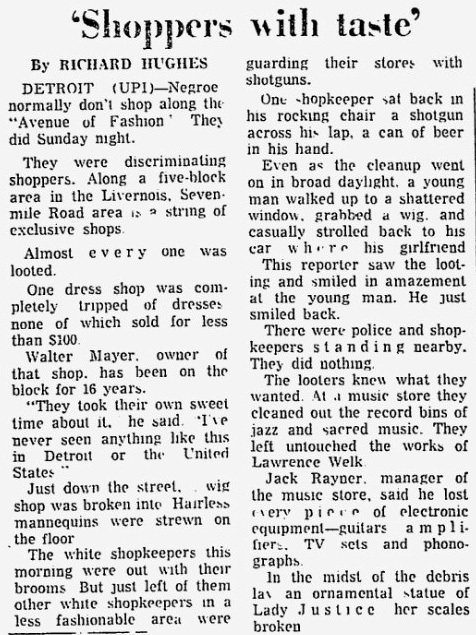 And there stories such as this one, about looters clearing out stores along the "Avenue of Fashion" along Livernois. Apparently Lawrence Welk albums were not a hot commodity. 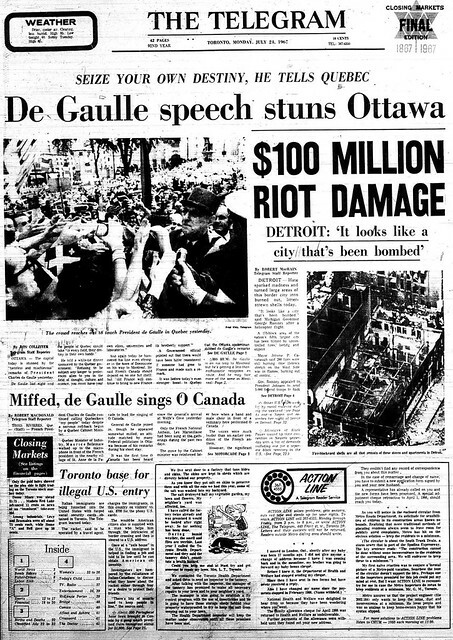 Starting that afternoon, coverage of the unrest in Detroit competed for front page space in Canadian papers with the fallout from another story unfolding on July 24: French president Charles de Gaulle’s “Vive le Quebeclibre!” speech in Montreal. 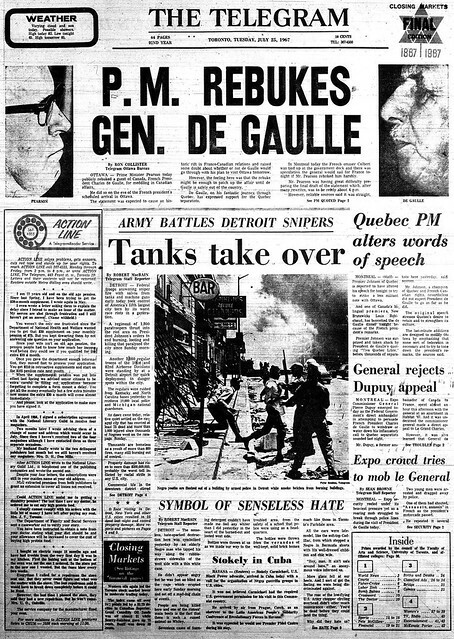 Front page, London Free Press, July 24, 1967. Click on image for larger version. Apart from straight reporting, there was little commentary in Toronto’s papers on July 24. Here are the front pages from each of the city's three dailies. 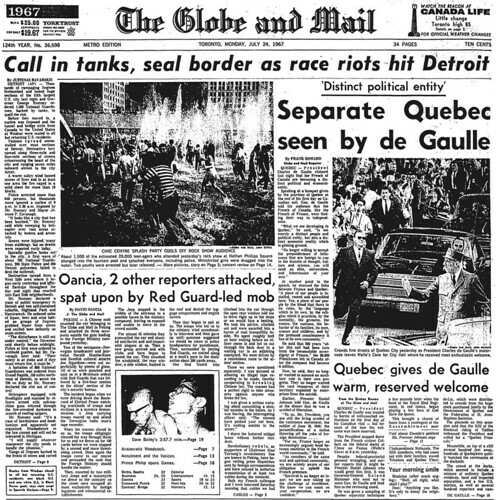 Front page, Globe and Mail, July 24, 1967. Click on image for larger version. 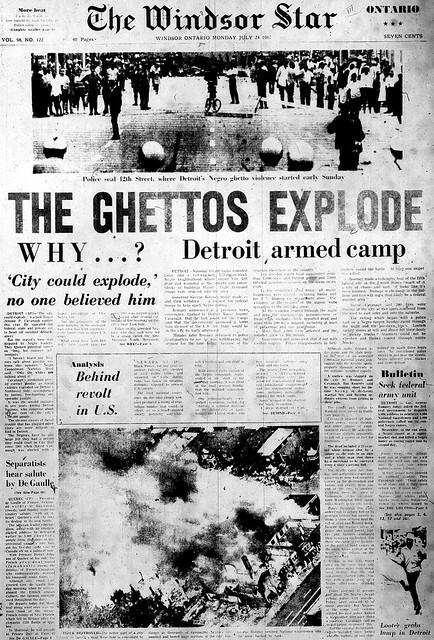 Front page, Toronto Star, July 24, 1967. Click on image for larger version. Front page, Telegram, July 24, 1967. Click on image for larger version. 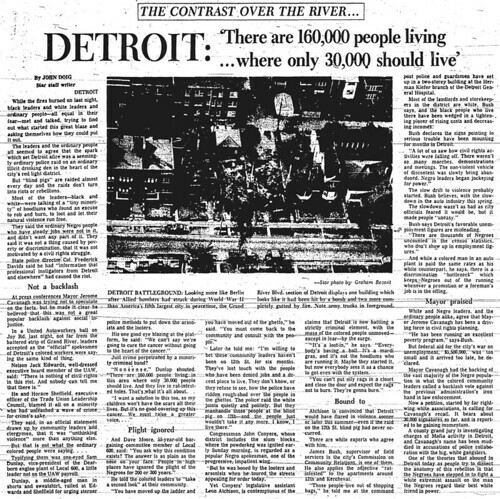 The closest piece to editorial comment that day was Lubor Zink’s column in the Telegram, which I suspect was in the can before unrest broke out in Detroit. 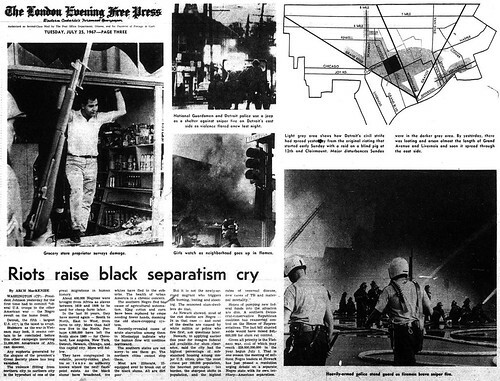 Commenting on black riots throughout the United States in recent years, the eternal Red-fighter naturally detected “Communist complicity” in what was going down. 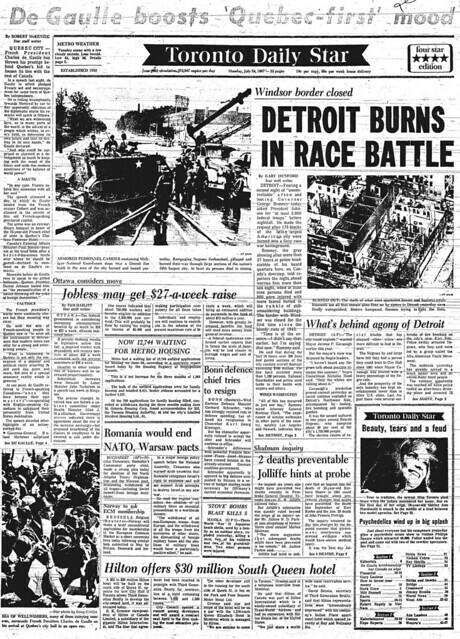 Next: Coverage from July 25, 1967.